It is impossible to describe argali sheep without using superlatives. 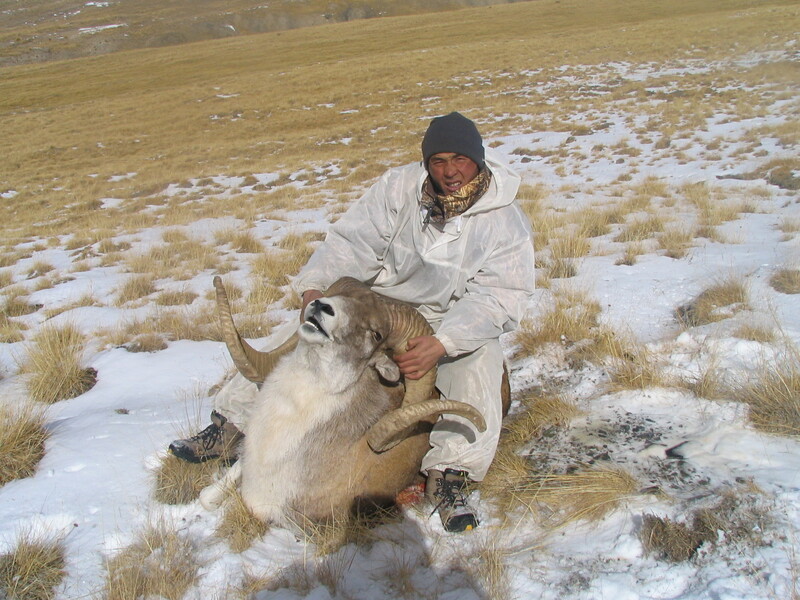 Argali is the largest, the most magnificent and the most desirable sheep trophy. Argali inhabit the most remote parts of the world, making travel from the North America to the mountain ranges populated by argali very long and tiresome. The mountains are spectacular, rich with wildlife, including ibex, wolves and snow leopards. The larges, the best known and the most numerous among argali sheep is Marco Polo. There are seven subspecies of argali sheep, some totally isolated. Several subspecies of argali, including Littldale, Karaganda and Karatau are very rare and are protected. Sergei Shushunov and Russian Hunting LLC. offer hunting expeditions to Kyrgyzstan and Tajikistan for Tian Shan and Marco polo argali. 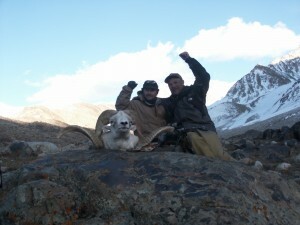 Tian Shan argali category is divided into two races: heinsii and karelini. 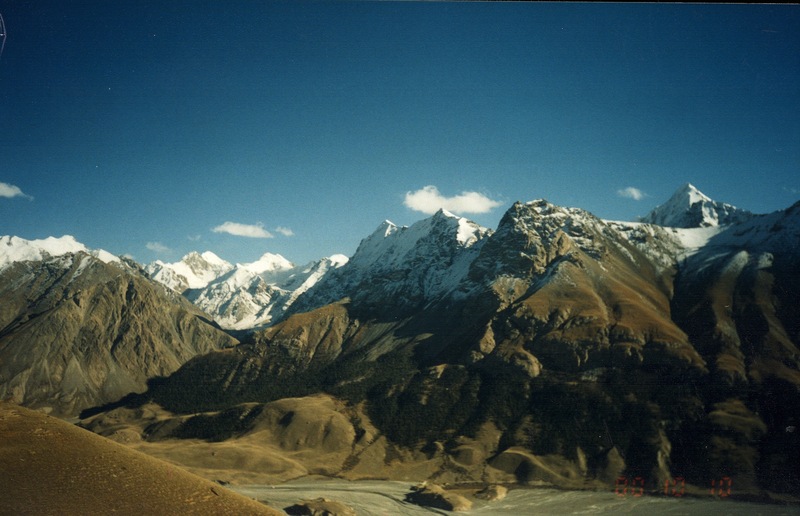 The karelini was described from the Ala Tau range north of Lake Issyk Kul in northeastern Kyrgyzstan and southeastern Kazakhstan, and eastward in the Tian Shan range in Xinjiang, China. It is similar to the Marco Polo, but it’s horns have a tighter curl and are generally thicker. The winter coat has light brown upper parts that lighten gradually to the diffuse, grayish-brown rump patch. The yellowish-white belly is separated from the flanks by a wide dark line. A dark dorsal line runs from shoulders to loins. The neck mane is white, shaded with grayish-brown. The record head was reported as picked up (1921) in the valley of the Yuldaz. Its longest horn measured 70-3/4 x 15-1/2 inches (179.7 x 39.4 cm), which is much larger than any other karelini of record. The Tian Shan range, from southeastern Kazakhstan and eastern Kyrgyzstan eastward to about Urumqi in Xinjiang. Boundaries with the Marco Polo argali to the south and west are unclear. 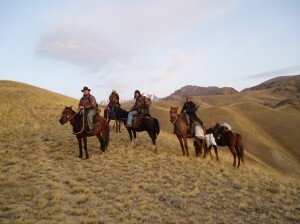 This hunt is offered in Kyrgyzstan. The hunter has to be in reasonably good physical condition. Horse riding skills are important, since riding a horse can greatly improve mobility. The hunt takes place at the altitudes of 3,000 meters (10,000 ft.) and higher. Any flat shooting cartridge in 7 mm Mag. to 300 Mag. Range is fine. Shots are expected at 250-500 meters (270-550 yards). It is necessary to bring good quality mountain boots, warm clothing and a sleeping bag. Normal duration of the tour is 10 days from Bishkek. As a rule, the trophy is obtained on the 5-7 th day of hunting. The eastern part of the Vakhan (or Wakhan) Corridor in Afghanistan; the Pamir Plateau in eastern Tajikistan; extending north into southeastern Kyrgyzstan south of the Naryn River; and the adjacent Pamir (Tagdumbash) region of far western China. The northern limit for the Marco Polo argali is the Naryn river. This hunt is offered in Kyrgyzstan and Tajikistan. There are substantial differences between hunts in these countries. Kyrgyzstan: trophies are in average smaller by 5 to 6 inches, hunts take place at elevations of 10,000 to 12,000 ft., horses are used 100% of the times, hunts are much less expensive. 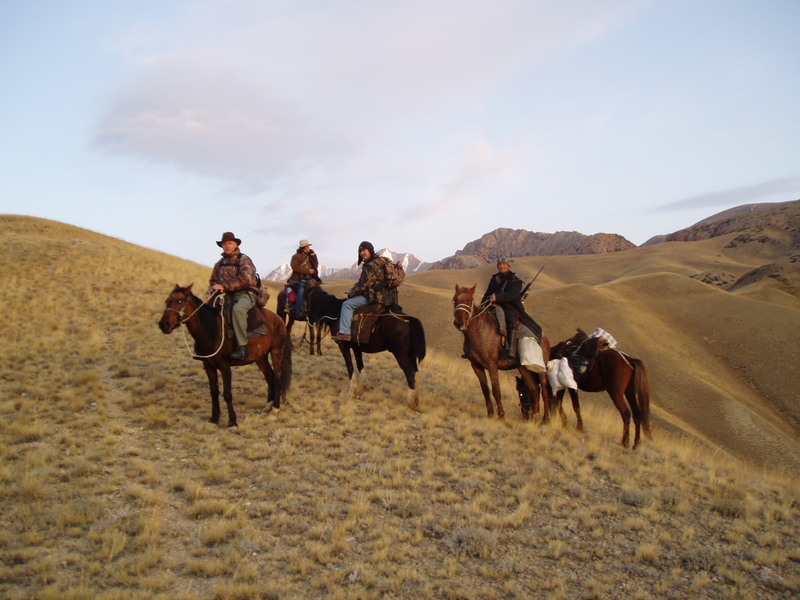 Tajikistan: larger trophies, elevations are between 13,000 and over 15,000 ft., horses are rarely used, hunts are expensive. Very high elevations at which the best trophies are found make it hard for the majority of hunters to place good shots. The hunter has to be in reasonably good physical condition to hunt in Kyrgyzstan and in top shape to successfully hunt in Tajikistan. Any flat shooting cartridge in 7 mm Mag. to 300 Mag. Range is fine. Shots are expected at 250-500 meters (270-550 yards). It is necessary to bring good quality mountain boots, warm clothing and a sleeping bag. Normal duration of the tour is 10 days from Bishkek. As a rule, the trophy is obtained on the 5-7 th day of hunting.